Hearing a cracking sound in your neck? It is mostly normal, but can be a sign of arthritis which usually improves with rest, medications and exercises. Some people find it weird that whenever they move their heads, they hear a crunching sound in neck. Some think the crackling sound in neck comes from the back of the head where it meets the neck. Others think it comes from the sides or the bottom of the head. While some do not give much thought about it, others are bothered and just want to know what to do about it. Is Crunching Sound in the Neck Normal? It is medically called crepitus, which refers to the grating, cracking, or popping sensation you hear or feel in the skin or joints or skin. The crepitus indicates air accumulation trapped in the compact space of the joint or subcutaneous tissue. When your tendon or muscle slides over a bony surface, a popping sound can sometimes be heard. In the neck, this can happen when your joints glide as you turn your head. This is normal. However, if crunching sound in neck is accompanied by pain, consult your doctor to find out if there is any underlying abnormality in the joint. There could be an injury in your ligaments or some loose cartilage. Other patients who have arthritis, tendinitis, or bursitis also experience cracking sounds, but a coarser crunching or grinding sensation may indicate advanced changes in the joints due to osteoarthritis. Arthritis of the neck orcervical osteoarthritis involves degenerative changes in the joints of the neck. These are often due to wear-and-tear of normal aging. As you grow older, the discs between the bones of the neck gradually wear down, lose lubrication, and become stiff. Cervical osteoarthritis usually begins in middle age and progresses as you grow older. Along with disc degeneration, abnormal growth of bones called spurs or osteophytes may occur in the neck. These bony growths can cause narrowing of the spinal canal, which contains the spinal cord or in the outlets where your spinal nerves pass. These symptoms are often severe in the morning and later in the day. However, they usually improve with rest. Treatment is usually conservative and includes the use of pain relievers or nonsteroidal anti-inflammatory drugs (NSAIDs) and other non-narcotic medications to reduce pain and inflammation. Chiropractic manipulation, physical therapy, and use of a cervical collar can also help improve symptoms. Severe pain and inflammation may also be relieved by injecting corticosteroids and local anesthetic into the neck joints or the epidural area surrounding the spine. Surgery is rarely required. Exercises may help relieve the symptom, but it is advisable to consult your physician before starting an exercise program for your neck. Tilting exercises involve moving the head along two planes. Begin by looking forward with the head and neck in neutral position. Tilt your head slowly towards the back until your eyes are looking towards the ceiling. Then hold the position for 2-3 seconds. Now tilt your head slowly forward while tucking your chin near the chest with your eyes facing the ground. Hold the position for 2-3 seconds and return to neutral position. Do this sequence 5-10 times. From the neutral position, gently tilt your head to the left by bringing your ear toward the shoulder, without actually touching it. Hold the position for 2-3 seconds; then return to neutral before tilting the head to your right side. Repeat for 5-10 repetitions. Rotation exercises for the neck involve two movements. The first exercise begins with the head looking straight with the eyes forward. 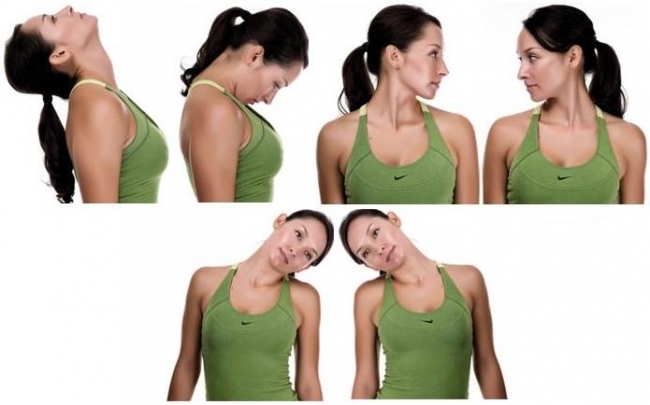 Rotate your head slowly to the left so that your chin hangs over your left shoulder. Hold the position for a second then return to the neutral position. Now slowly rotate the head to the other side, pausing for a second to let your chin hover over the right shoulder. Do this sequence 5 times. The second exercise consists of dropping the head on the right shoulder, then slowly rolling it completely around the neck clockwise the counter-clockwise. Begin in a neutral position. Press your palms against the forehead. Using your neck muscles, gently press your head forward while resisting this movement with the hands. Hold for five seconds. Now press your hands against the back of the head. Gently push backward while resisting this movement with the hands. Hold for five seconds. Now press the left side of the head with your left hand and push slowly against resistance. Do the same on the right side. Perform these neck exercises carefully, without pushing too hard as this may cause injury. Avoid performing neck exercises if they cause excessive pain or discomfort. Consult your doctor if you experience persistent neck pain.